Thai massage is often described as “lazy yoga.” It uses quite similar techniques as Swedish massage, but Thai massage also stimulates the acupressure points in relation to the concept of energy lines in order to provide major relief by working on tendons and by stretching and loosening tightened muscles. This dedicated work releases tension and relieves joints. Thai massage leaves you feeling relaxed and energized. In addition, Thai massage uses the technique of unblocking and releasing the blood flow by applying sustained pressure for around 30 seconds to the areas where legs and arms meet the torso. This is a real circulation booster. When the pressure is released, you suddenly feel a rush of heat as blood floods back along your limbs. Is a style of massage in Thai style that involves stretching and deep massage. The client wears comfortable clothes that allow for movement. No oils are used in Traditional Thai Massage but you can have a completely different type of massage which we are certified in – Oil Massage & Aromatherapy. Thai massage is total body therapy. Through a series of assisted Yoga-likes stretches, alongside gentle traction and pressure point, it is a type of massage that follows the body’s energy lines (referred to in Thai as “Sen” channels). This extraordinary massage helps relieve tension and lubricates joints. It also increases vitality and awareness and allows you to achieve a deep state of tranquility. Thai massage is one of the oldest massage techniques in existence today. Dating back 2,500 years, Thai massage is said to have been developed by Buddhist monks right at the time when Gautama Buddha himself was still alive. These monks handed what they know to their students, who then passed them on to their own students until it spread throughout the east. Thai massage incorporates the philosophies surrounding the Chinese concept of acupuncture and combines these philosophies with the stretching exercises done by yogis in India. The ultimate aim of Thai massage is for the receiver to attain spiritual enlightenment and harmony. On a base level, Thai massage is supposed to activate the capacity of the body to heal itself and to promote better health and well-being. Just like in most eastern healing practices, Thai massage makes use of pressure points, which are called sen in Thailand. Practitioners of Thai massage claim that there are 72,000 sen in the body, of which ten are on the highest priority when it comes to doing the massage. Applying pressure to these sen points unblocks the flow of energy and restores balance to the body. In the terms of conventional western medicine, Thai massage is supposed to increase the circulation of blood within the body and completely eliminate the toxins that cause pain and illness to the body. Thai massage is done with both the giver and the receiver of the massage fully clothed. The massage therapist does not use any tools – only her fingers, hands, knees, legs and feet. She also uses body weight to apply force and pressure to the receiver’s body. The treatment is done with the receiver lying down on her back on a padded massage mat instead of a table. Thai massage and Thai medicine are said to have been practiced for over 2500 years and founded by the legendary Shivago Komarpaj ( another variant is Jivaka Kumara Phaccha ), who was a personal physician to the Sangha (Buddhist monks), a friend and physician to the Buddha and renowned as a healer in Buddhist tradition. Though there are many influences for Thai medicine from Chinese, Indian and Southeast Asian culture, credit is given mostly to Mr Komarpaj. As practiced and taught by Khun Paschal, this therapeutic massage emphasized balancing and strengthening and is based on the concept of vital life force energy. This energy flows along channels in the body called “sen”. “Sen” lines correspond to the meridians of Chinese medicine and the “nadi” of Indian points. These points are addressed specifically by the therapist doing the massage and are pressured, rubbed and stretched through manipulation by the therapists’ feet, knees, elbows and hands. As a healer, Khun Phaccha’s social role was closer to a religious figure than to a medicinal doctor. As such, the ancient texts (originally on palm leaves) which describe his teachings, as well as the followers who continued in his path were closely associated with life within the temples and centers of Buddhist life. After the invading armies of Burma destroyed Ayutthaya, the capital was moved further south to Bangkok. As soon as the Royal Family settled down in the new Grand Palace, all surviving text and inscriptions referring to the ancient art of massage were summoned and brought to the neighboring temple, Wat Po and were transcribed to stone tablets, where they remain to this day. Traditional Thai medicine is a natural, holistic approach to health and well-being, developed over thousands of years and this includes proper nutrition, physical exercise, the use of medicinal herbs and therapeutic massage. Besides curing diseases and ailments, the primary goal of traditional Thai medicine is maintaining health and well-being as the ancient Thais live by the saying, “the absence of illness is the best blessing”. Thai massage is one of the four branches of traditional Thai medicine. It is a healing technique that was practiced before doctors. The massage involves point pressure and stretching and it can be done on the floor, a firm mattress or a mat. It is a therapeutic procedure that provides relaxation and restores healthy blood circulation. It also treats energy blockages, weak dysfunctional organs, aches and pains, stress and tension, flexibility, paralysis, nerve problems and postural alignments. 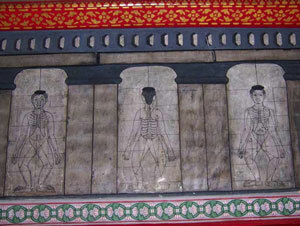 Till this day, Thai Massage Association continues to serve as foundation to the rich history of Thai massage. Thai Massage Association has a very active school located within the temple grounds that serves as a training center for many massage therapists in Thailand ( Chiang Mai and Bangkok). One of the biggest advantages of Thai massage is that it is extremely useful in strengthening the joints and helps the body fight against chronic joint problems. Moreover, this form of massage is highly effective in treating health troubles such as back pain, neck pain, frozen shoulder, migraines, and knee pain besides slowing down the aging process. On top of that, Thai massage helps in promoting the sense of well-being and vitality. It helps clear and calm the mind so that you can have a positive outlook towards life. Moreover, this kind of massage has the potential of relaxing the soft tissue muscles and help in reducing stress, promoting flexibility and revitalization, and drawing out excess oil and impurities from surface of the skin to promote cell rejuvenation. A study conducted in Thailand investigates the effects of traditional Thai massage on scapulocostal syndrome (SCS), a musculoskeletal pain syndrome in the posterior shoulder area. It provides evidence that Thai massage reduces pain, muscle tension, and anxiety in patients who had myofascial trigger points in the scapular region. Twenty patients were chosen aged 18 – 50 who were experiencing “spontaneous scapular pain which lasted 12 weeks” according to the study report. The researchers were concerned with comparing the effectiveness of Thai massage to physical therapy. The patients were divided into two groups and their progress was monitored by someone who was not aware of who was receiving which treatment. Pain scales were used to monitor pain before the study began, during treatment and then long term. The Thai massage group received 30 minute sessions nine times over the course of three weeks around the scapular area while lying on their side. The physical therapy group received heat packs and ultrasound treatment for the same amount of time. Researchers found a significant improvement in the Thai massage group. Overall, the Thai massage group felt more satisfied. The physical therapy group did, however, notice moderate improvements in their scapular pain.